Geologists divide the history of the earth into four eons. Each is represented by a strip of illustrations and captions prefaced by an introduction. Our planet began as a sphere of molten metal. Heavier ores sunk to the center, resulting in gravity. As Earth cooled, its crust was formed. 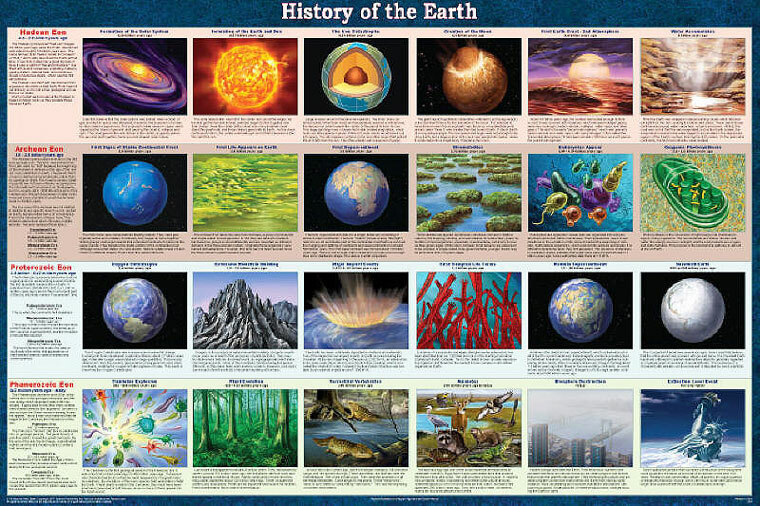 Other topics include the creation of the moon, the appearance of various atmospheres, the formation of continents, continental drift, snowball Earth, and the development of life. The third through fifth pictures on the bottom row reflect the period covered by Eras of Life. The last picture shows the near future - the results of humans destroying the environment.